TSPSC Hostel Welfare Officers Merit list Results (Ranking list Results) at tspsc website 2018 /TSPSC Hostel Welfare Officers Recruitment Hall tickets 2018, TSPSC Hostel Welfare Officers Recruitment Exam date 2018, TSPSC is going to fill Hostel Welfare Officers in TS BC Welfare Department and Tribal Welfare Department 2018. 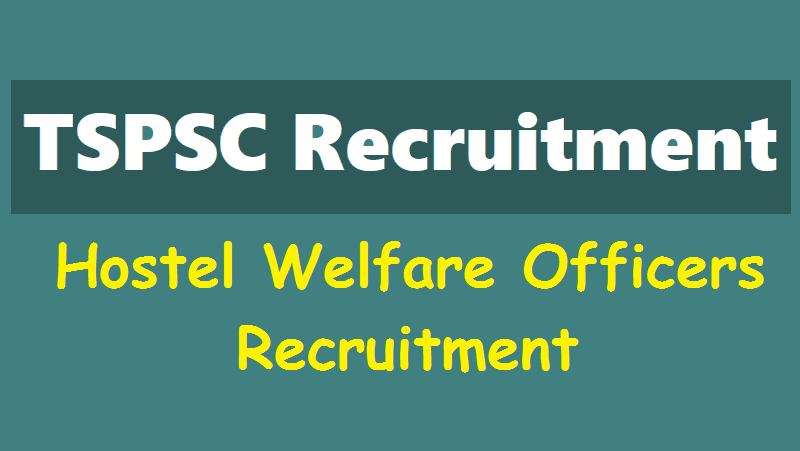 TSPSC Hostel Welfare Officers Recruitment 2018, Hostel Welfare Officer Posts in TS BC Welfare Department and Tribal Welfare Department 2018 : Telangana State Public Service Commission (TSPSC), Hyderabad issued TSPSC Hostel Welfare Officers Recruitment 2018 Notification () for the recruitment of 310 HWO posts in in Tribal Welfare and BC Welfare Departments, Telangana State. Eligible candidates can apply online through tspsc.gov.in from 06.02.2018 to 06.03.2018. The Telangana State Public Service Commission invites application forms from the qualified candidates for recruitment in Tribal Welfare and BC Welfare Departments. The TSPSC issued notification for the total number of 310 posts. 219 Grade-II Officer posts in the BC Welfare Board. The TSPSPC notification for recruitment of 87 Grade-2 Hostel Wolf Officers in the tribal welfare department as well as four Grade I posts to be filled. TSPSC has informed that due to short fall in the earlier Certificate Verification for above post, 20 candidates are provisionally picked up for 2nd Spell verification. The list is available in Commission’s website. The verification of certificates scheduled to be held on 23/04/2019 from 10:00 AM onwards at O/o Telangana State Public Service Commission, Nampally, Hyderabad. The candidates may exercise their web options for district preference from 18/04/2019 onwards. For further details please visit Commission’s website (www.tspsc.gov.in). TSPSC has conducted written examination for recruitment to the post of Hostel Welfare Officer Grade II in Tribal Department, notified vide Commission’s Notification No.07/2018 & of Hostel Welfare Officer Grade -II in Backward Classes Welfare Department, notified vide Commission’s Notification No.08/2018 on 29/07/2018 FN & AN. The Merit Lists of these notifications are prepared and are made available in the Commission’s Website. The candidates if any are admitted in the Merit Lists as per the Court Orders, their admission is purely provisional and subject to outcome of the final judgments in the respective W.Ps/W.As pending before the High Court. TSPSC Hostel Welfare Officers Merit list Results at tspsc website 2018: The TSPSC has conducted Common Written Examination for the Hostel Welfare Officers Grade-I in Tribal Welfare Department vide Notification No. 07/2018 on 29/07/2018 FN & AN.The Merit list results have been released by the TSSC and The Hall ticket numbers in Merit list of all the candidates who attended the exam were displayed on Commission’s website. TSPSC Hostel Welfare Officers Merit list Results are hosted on TSPSC website on 06-12-2018. The written exam (OMR based) for the post of Hostel Welfare Officers Grade-II in BC Welfare Department & Tribal Welfare Department is scheduled to be held on 29/07/2018 FN & AN. The candidate can download the Hall Tickets from 24/07/2018 onwards which will be available in Commission’s website (www.tspsc.gov.in). Name of the Recruitment: HOSTEL WELFARE OFFICERS GRADE-II IN TRIBAL and BC Welfare WELFARE DEPARTMENT. Hostel Welfare Officer Posts The Written OMR Base Examination fo the post of Hostel welfare Officers Grade II in Tribal welfare Department for 87 vacancies and Hostel Welfare Officers Grafe II in BC Welfare Department for 219 vacancies are scheduled to be held on 29-07-2018. Step 4: Find the Notification No. and Click on it. Hall tickets: (TSPSC Hostel Welfare Officers Recruitment Hall tickets 2018) Hall tickets can be downloaded 7 days before commencement of Examination. Minimum 18 years & Maximum 44 years as on 01.07.2018. Upper age limit will be relaxed as per rules. (Remittance of Fee) Each applicant must pay Rs. 200/- (RUPEES TWO HUNDRED ONLY) towards Online Application Processing Fee. This apart, the applicants have to pay RS. 80/- (RUPEES EIGHTY ONLY) towards Examination Fee. However, the following category of candidates are exempted from payment of Examination fee. b) Unemployed applicants in the age group of 18 to 44 years of Telangana State (They have to submit declaration at an appropriate time to the Commission that they are unemployed). c) PH & Ex-service men. N.B. :- BC’s, SC’s and ST’s belonging to other states are not exempted from payment of Application processing Fee and Examination Fee and they are not entitled for any kind of reservation.. The fee once remitted, shall not be refunded or adjusted under any circumstances. given in ANNEXURE – II. Eligible candidates can apply online through tspsc.gov.in from 06.02.2018 to 06.03.2018. Candidates should complete the OTR process before applying online. Candidates required to pay Rs. 200/- towards Application Processing Fee and Rs. 80/- towards Examination Fee. SC/ ST/ BC/ Unemployed applicants, PwD, Ex-SM candidates are exempted from payment of Examination Fee. Telangana TSPSC Recruitment 2018 for the post of Hostel Welfare Officers in Grade-I and Grade-II is scheduled to begin on 6th February 2018, next week on the official website of Telangana State Public Service Commission (TSPSC) – tspsc.gov.in. TSPSC aims to recruit candidates for the post of Hostel Welfare Officers in Backward Classes Welfare Department, Tribal Department and Tribal Welfare Department in the state of Telangana. Eligible and interested candidates can go through the details below and start applying online from 6th February 2018 till 6th March 2018. Selection will be made through Written Test. Candidates will be selected on the basis of an Objective Type Examination which will be conducted in Online/OMR mode. Click here to download detailed Notification. Candidates are requested to refer to detailed Notification before applying online. READ | How to apply for TSPSC Recruitment? Is this a government job or contract job?